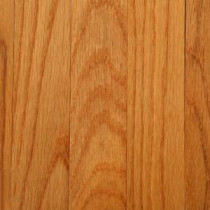 Buy online Butterscotch Oak 3/4 in. Thick x 2-1/4 in. Wide x Random Length Solid Hardwood Flooring (20 sq. ft. / case) AHS626 and leave review or share with Your friends. Get the versatile look of oak flooring with the Bruce Butterscotch Oak 3/4 in. Thick x 2-1/4 in. Wide x Random Length Solid Hardwood Flooring (20 sq. ft./case). The random length of the planks adds dimension to your room. The medium butterscotch oak finish will match many home interiors. The planks have an eased edge with square ends and are appropriate for both above- and on-grade installations. This flooring requires nail-down installation. 20.67 sq. ft. per case - Case weight: 55 lb.